Rutgers - Science Summer Abroad 2012: Forestry Development Department & St Peter's Dunboyne hurling match! Forestry Development Department & St Peter's Dunboyne hurling match! On Friday we got to go to an actual forestry field instead of staying in a conference room and being lectured about how everything works. I enjoy hands-on learning much more than a classroom setting, it also makes it pretty much mandatory to stay awake. This day was definitely the most agriculture-related day, which I know nothing about. The farmer's name is Anthony Mooney and he is also being assisted by the company Teagasc so smaller business will succeed and flourish. We were able to see different processes like how the trees are grown (obviously) on the farm but then some are turned into timber, others, wood chips, etc. It seemed like most of his land was dedicated to growing ash and sycamore. It's important to get tall pieces for timber and a farmer gets tall, unbranched trees by weeding out smaller trees that have no chance of being timber and the tree branches are pruned so the tree will grow straighter. 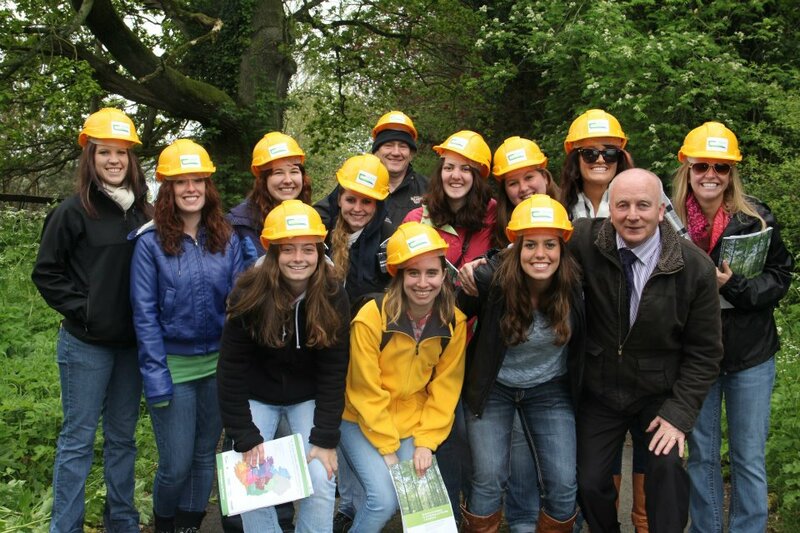 After the forestry field, our professor arranged with our bus driver to go back to Dunboyne for the hurling match. However, it was about noon time and the match wasn't until late that evening. So we stopped at a place called The Mint Leaf for lunch, then we were able to set out and explore the town as we pleased, meet up at a restaurant/pub called Slevin's for dinner, and then we would all make our way over to the pitch. The town was small and lovely. If you knew the name of one hurling player, you could connect with almost anymore. This was this first place that I found myself looking in real estate offices. I ended up buying a hurling jersey, supporting the local team and planned to have any hurling players I could get to, sign it. 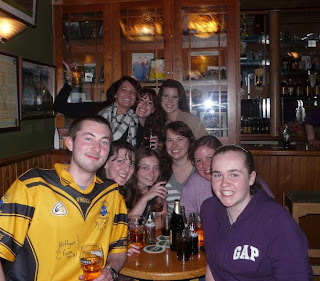 Everything went as planned, we met up at Slevin's for dinner and walked over to the pitch for the game and they even waived the entry fee for us! The game was fast and intense. Unfortunately, we lost, but a few of the hurling players offered to take us out to a pub called Brady's after the match. Our professor approved this and arranged with our lovely bus driver to pick us up outside of Brady's at 11pm. This had to be the best experience of local life during the whole trip. It was really great just talking to everyone for a few hours since this was a smaller town, pretty much everyone was locals as opposed to in Dublin, there's a good amount of tourists. Overall, a really great night for me. I wish we could have stayed longer, but we had to be out the door for a tour at 8am the next morning.